Sposh Microfiber Sheets are peachy soft! These economical sheets are virtually wrinkle-free when you pull them from the dryer. In fact, microfiber is a super fabric - it dries in a flash, it's easy to maintain, and it's durable, which helps you save time and money. 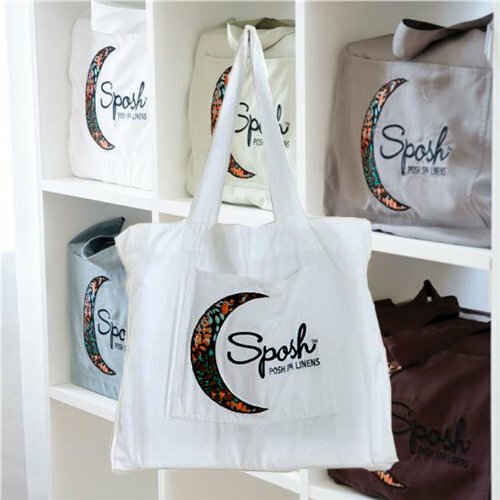 Sposh sheet sets come with 1 fitted sheet, 1 flat sheet, 2 pillow cases, and a cute complimentary tote! Queen size measurements - Flat Sheet 94" x 105" Fitted Sheet 60" x 80" (will accommodate a mattress up to 18" high) Pillow Cases 20.5" x 34"
Available in Blue Agate, Coffee, Cream, Moonstone, Tea Leaf and White. Available in King and Queen sizes. If you have any questions about this product by Sposh, contact us by completing and submitting the form below. If you are looking for a specif part number, please include it with your message.